"The Song of the Lark," 1884. Jules-Adolphe Breton. At the Art Institute of Chicago. A Romantic-Realist, Breton followed in the footsteps of Gustave Courbet and Jean-François Millet. 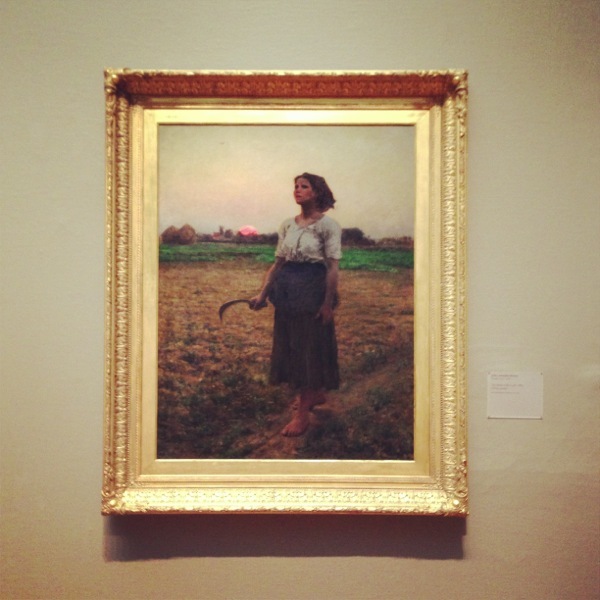 "The Song of the Lark" - one of Breton's most well regarded works - appeals to the nostalgic sentimentality of the peasant class, in vogue at the time. As for the painting's meaning, larks are small birds, associated with dawn and known for their pleasing voices and melodic song. Shakespeare wrote of the lark in Sonnet 29, "the lark at break of day arising / From sullen earth, sings hymns at heaven's gate" (11-12). The Lark is also related to love. Does the woman in the painting have a lover waiting for her at the end of the day, or is she dreaming of finding a suitor to wisk her away? We'll never know for sure. With her stoic expression, the woman in the painting isn't giving anything away. She has a long day of working in the fields ahead of her. Meanwhile, the lark sings overhead.